Instagram has launched a new resource for the parents of teenagers who use Instagram. Called A Parent’s Guide, this is Instagram reaching out to parents who may be starting to wonder whether social media apps like Instagram are a bad influence on their children. With most teenagers spending every waking moment on their smartphones Are You Addicted To Your Smartphone? Are You Addicted To Your Smartphone? At one time, landlines and payphones were all we had--and we survived just fine, thank you very much. But now, it’s almost laughable if you don’t own an iPhone or Android, and for some of... Read More , parents are becoming increasingly worried about what they’re doing online. And with Instagram being extremely popular with teenagers, Instagram is attempting to calm parents’ fears. Instagram’s A Parents Guide is “designed to help parents and guardians learn more about how teens are using Instagram and to ensure they’re using the app in a positive way.” To that end, Instagram has focused on how to manage privacy, comments, and time. Manage Privacy details how teenagers can choose to make their account public or private, and what having a private Instagram account means. It also details how to block unwanted interactions, which stops people seeing their posts. Manage Comments details the “Comment controls” section of the app. It also details how teens can block comments, report comments and/or accounts that violate Instagram’s policies, and filter out comments containing certain words and phrases. Manage Time details how teenagers (or their parents) can monitor and manage their time spent on Instagram. Instagram now lets you set daily reminders and mute push notifications All of which should help prevent social media addiction Facebook Helps You Fight Your Social Media Addiction Facebook Helps You Fight Your Social Media Addiction Facebook is trying to help social media addicts by launching tools designed to help you manage your Facebook and Instagram addiction. Read More . 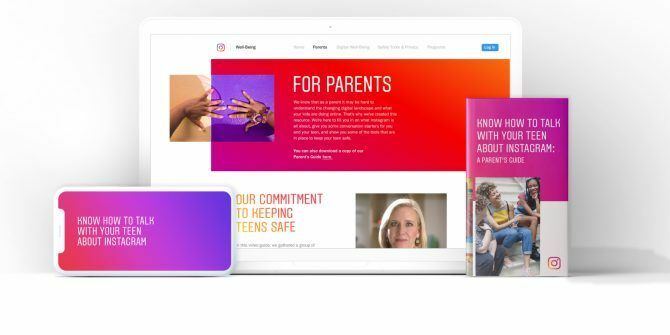 Instagram has crafted A Parent’s Guide in collaboration with organizations including the National PTA, Scholastic, ConnectSafely, Boys & Girls Clubs of America, and the National Bullying Prevention Center. Which adds a touch of authority to the document. If you are a parent worried about your child’s online activities, we have previously listed some fantastic apps for parents living through the digital age 5 Apps for Parents in the Digital Age 5 Apps for Parents in the Digital Age Cool Websites and Apps points out five apps that make being a parent in the Internet age just a little bit easier. Read More . However, in the end, we may just have to accept that parents and teenagers have different internets Parents and Teens Don't Understand Each Other's Internets Parents and Teens Don't Understand Each Other's Internets There comes a time in every parent's life, when you realize that you're finally out of touch with what kids are "into" these days. Read More . Explore more about: Instagram, Parenting and Technology. One important tip I figured out my self: Instagram doesn't have any inbuilt negative content protection. Your child's account is vulnerable to bullying, smoking and drinking content. Until the time they present a worthy protection is better to care about your child with some add-ons like spamguardapp.